AT ONLY 16, RJ STREATER of Cheshire, CT, knows exactly what he wants to do with his life. 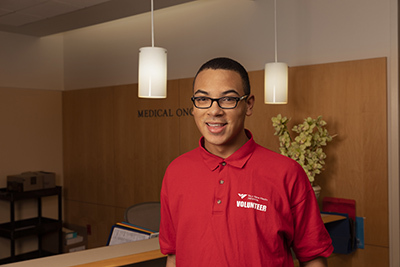 RJ’s experience as a YNHH youth volunteer has given him an early look into the world of medicine and an opportunity to get some real, hands-on experience in different departments of the hospital. Based on what he’s seen so far, he’s decided he wants to become a physician specializing in medical oncology. “I’ve known I wanted to work in medicine since I was in eighth grade,” says RJ. Both his parents are profes-sionals in the field of medicine. And he’s always loved science and biology in school. Fifteen is the minimum age for a youth volunteer, and RJ didn’t waste a moment. He’s already completed three volunteer sessions—one last summer and two during the school year. In June he began his fourth session, where, in addition to helping out on one of the units, he’s also serving as a leader/ mentor for all of the new students joining the program. 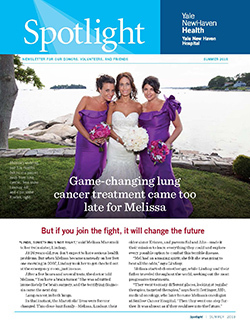 Clearly, word has gotten out about how gratifying and valuable the volunteer program is at YNHH. It’s growing by leaps and bounds. This year, there will be 450 kids participating along with RJ. Wonderful for the staff, wonderful for the patients. And it’s paving the way for the medical professionals of tomorrow. It’s a win-win!